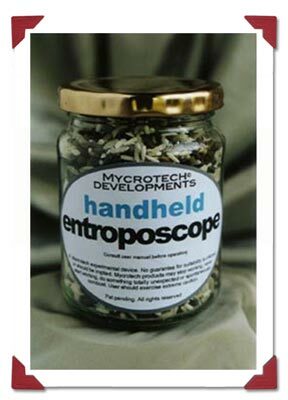 Mycroft's Entroposcope. (Real thing) This is actually a downloadable widget that you can make yourself, although I gathered a few together when TN-2 was being published and gave them away at the launch party. Containing lentils and rice, I think these are great fun and totally useless. Mycrotech made good money out of them, though. One of them (number seven, I think) was auctioned, along with a dodo home cloning kit, at the Exeter Microcon 2003. It went for £12. 50 numbered and signed editions.